Are any of the BRIC countries saddled with a Jewish-run money system in which their national currency appears in the form of an interest-bearing loan? If not, then their freedom from usury might partly account for their rapid economic rise. We have a vampire on our backs, sucking our blood, sapping our strength. They don’t. The “crisis in Ukraine” was instigated by Zionists, who hired a local mercenary group (Right Sector) to topple the legitimate former government of Ukraine, and equipped and paid them with money supplied by the US. 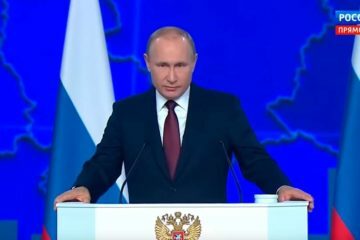 The intent was to convert Ukraine into a stage for Zionist theater, on which will be performed plays scripted to make Russia look like the villain. The first of these plays opened last July with the shooting down of Malaysian airline flight MH 17. The event was timed so that it would divert attention away from Israel’s genocidal campaign against the Palestinians in Gaza, by giving the (mostly Jewish owned) media something else to talk about. The artificial and Zionist nature of the 2014 revolution in Ukraine is why Jews began popping up like weeds in Ukraine’s top political offices immediately after the dust had settled. Ukraine is a country having 500 gentiles for each Jew, and it is no surprise that the great majority of the population is Ukrainian by ethnicity and not merely by citizenship. Yet the prime minister put in office by the revolution, Arseniy Petrovych Yatsenyuk, is Jewish. Although Yetsenyuk retired from office because of the dissolution of the coalition that his party had been leading, his successor, Volodymyr Borysovych Groysman, is also a Jew. At about the same time, several of Ukraine’s administrative districts, including Donetsk and Dnipropetrovsk, acquired new Jewish governors. In the two named districts, they are Serhiy Taruta and Igor Kolomoisky, respectively. Once in power, the Zionists did a number of things immediately. First, they stripped Ukraine of its local gold reserves and sent it off to New York’s Federal Reserve Bank, ostensibly for “safekeeping.” You know, like Germany had done earlier and then discovered that it couldn’t get any of its gold back again. Next, they indebted Ukraine by accepting “development” loans from the Jewish banks in the European Union. To pay the interest on these loans, the Zionists in Kiev raised taxes, imposed new taxes, and stole about half the money in every pension fund in the country. That’s why Ukraine can’t be a BRIC country. 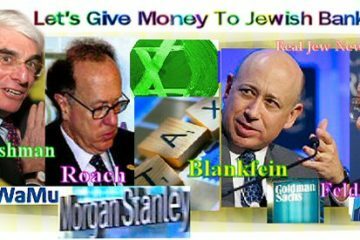 They now have the vampire of Jewish usury on their backs. The economic meddling of the Zionists in Ukraine are in the classic form of such vampirism: using loans and laws and taxes as a means of transferring wealth from Gentiles to Jews. the Buk surface-to-air missile launchers that were in the possession of the Ukraine government’s military forces. It is not surprising that this missile system is Russian-made, since nearly all of the advanced heavy weapons in that area are Russian-made, regardless who owns them. The location of the manufacturer of the weapon is not important. Rather, what is important is who aimed the weapon and pulled the trigger. And the villain is most likely the Jews who hold the power in Kiev. So, assuming that what you want to do is punish egregious immorality, to put an end to an evil that destroys cultures, ruins nations, and commits mass murder and genocide more than any other force on Earth, then your purpose is clear: destroy Zionism. Destroy the power of international Jewry. Burn their money, outlaw their banks, repudiate all debts to them, and, if they want to fight about it, fight them until they are gone from this world. So that’s what The Economist wouldn’t let me say on their Web site. You see, the rules regarding content of speech are written to suppress certain political truths about our world. There are topical and opinion taboos which most Terms of Service implicitly enforce. And I intentionally broke one of them, as is my habit.